You can easily manage your contacts from your projects dashboard. To go to your contacts list, click Edit on the contacts panel from your projects dashboard. Find the contact that you wish to have access to your portal, then click Give Access. Note: Give Access button only appears when the contacts has no access to the portal yet. This is the case when you've added a contact and you didn't check the Access to Portal checkbox. 2. You will be redirected to the Projects Involved section. Choose which project/s you are going to allow the contact to see on his portal. 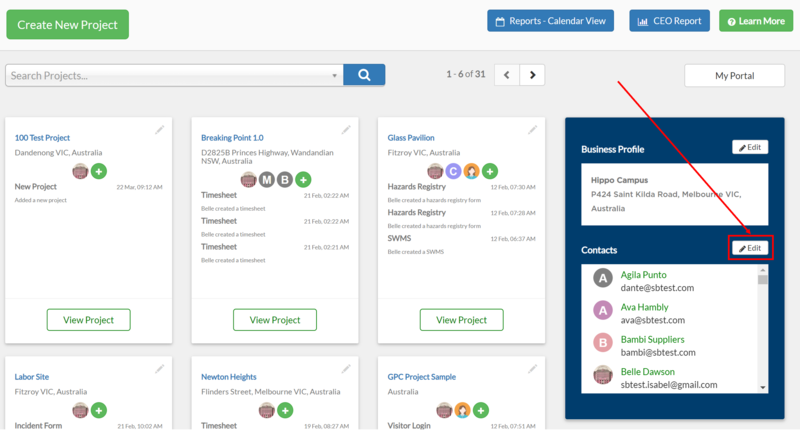 Tick Access to all Projects checkbox to allow the contact to see all your company's on-going projects on his portal. Click Choose a Project drop down menu to choose a specific project from your company's on-going projects. You can do this multiple times by clicking (+) Add Project button. Click the User Type drop down menu to change the type of access of the contact on each project. Cost Rate Per Hour field is only enabled once the user type is changed into Employee or Manager. You can input here the hourly rate of the contact on that corresponding project. 3. Once you've selected a project that you want the contact to be involved in, click Done. By editing access to projects, you are allowing the contact to access specific projects. 1. You can edit a contact's access to projects whether he/she has an access to portal or not. A. To edit access to projects of a contact who has access to portal, click Remove Access. This would trigger a confirmation box. Click Edit Access to Projects. B. To edit access to projects of a contact who has no access to portal, click either Give Access or Edit. 2. You will be redirected to the Projects Involved section. Here, you can select a single project or multiple projects that you allow the contact to access. Click the User Type drop down menu to change the user type of the contact on each project. 3. Once you've selected project/s that you want the contact to be involved in, click Done. 1. Find the contact that you wish to remove access from your portal, then click Remove Access. Note: Remove Access button only appears to those contacts that have an access to your portal. This is the case when you've added a contact and you checked the Access to Portal checkbox, or when you've given access to the contact by assigning Projects Involved. 2. Click Remove Access to Portal. 3. A "Success!" prompt will appear. Click OK.
You will still see the contact on your contacts list even if you remove that contact's access to your portal. To completely remove the contact from your list, choose to delete the contact. Find the contact that you wish to delete, then click Edit. 2. Scroll down at the bottom. Click Delete Contact. 3. Click Delete from Portal. 4. A "Success!" prompt will appear. Click OK.